You have arrived in the future. The year is 2017 and now, more than ever, technology has become more than just a feature, it has become a lifestyle. You probably have an app to control the temperature and music in your home. Right? The appliance industry is no exception, and living like the Jetson’s is practically a reality. While many manufacturers are utilizing technology to make food preparation easier, a few manufacturers stick out. Among Jenn-Air, Wolf, Dacor, and LG, Samsung and Miele have stood out the most for their wall ovens. 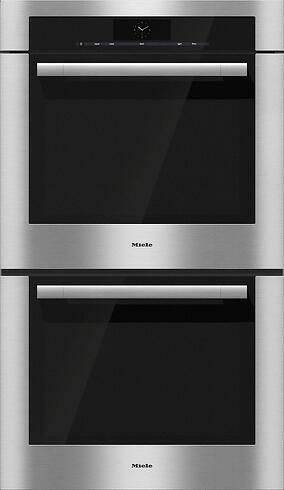 We will look at the future and compare two very different companies, Samsung and Miele, and their wall ovens. Samsung, the South Korean multinational conglomerate, has been in the appliance industry longer than you think. Samsung first began manufacturing microwave ovens in the early 1980s. From there, they mainly focused on consumer electronics. However, in recent years Samsung has made a strong push into the home appliance market and has brought their feature and technology forward philosophies with them. For proof of their ambitions, look no further than their purchase of appliance manufacturer Dacor in 2016. Samsung is the only company to be competitive in technology with Apple, so they should push the envelope for incorporating cool features in appliances. Miele has been a long stay in the appliance world and aims to position itself in the premium segment of home appliances. Miele began in 1899 with just eleven employees and is still a family-owned company today. They are committed to offering products that aspire to set the standard for longevity, functionally, beauty, and are environmentally conscious. Also, there is no appliance company in the world that manufactures more of its own components than Miele. As a homeowner, what does this mean for you? Reliability and durability - which to many is a big consideration when choosing new appliances. The downside? Miele’s stringent quality control has a premium cost. It could also impair their ability to develop new products compared to a company like Samsung. Now let's talk about the two wall ovens. Samsung’s first ever double wall oven. While you can’t watch TV on Samsung’s wall oven (yet), the design of the unit shows Samsung’s belief that they can enrich people’s lives by innovating technology that changes the way we utilize, interact, and rely on our home appliances. The single biggest feature that changes how we interact with our appliances are the controls. Samsung’s double wall oven does not fall short here. Through a digital and analog interface, Samsung retains the familiarity of knobs with the limitless possibilities of a touchscreen. 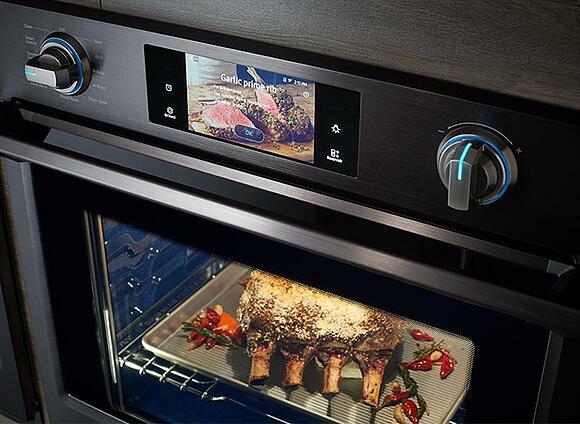 The touchscreen features one of Samsung’s most exciting properties: Gourmet Cook. 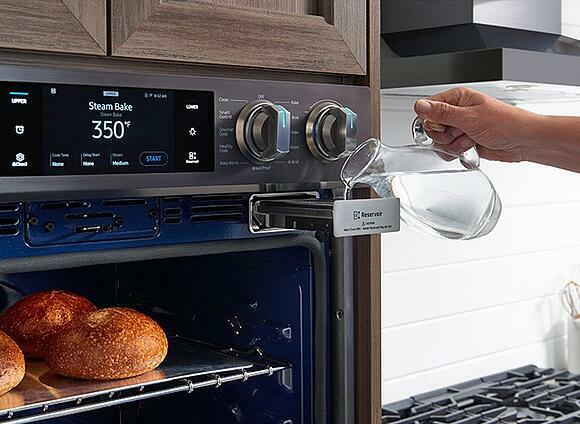 Not only does it provide onscreen prompts and cooking tips to help you achieve the best results possible, Samsung has also integrated a “start time” feature, allowing you to direct one of the ovens when to precisely begin cooking. If you are entertaining, the oven also connects to Wi-Fi allowing you to step away from the kitchen and remotely monitor its status. For even more flexibility, you can turn the oven on/off, preheat, and adjust the temperature all remotely. 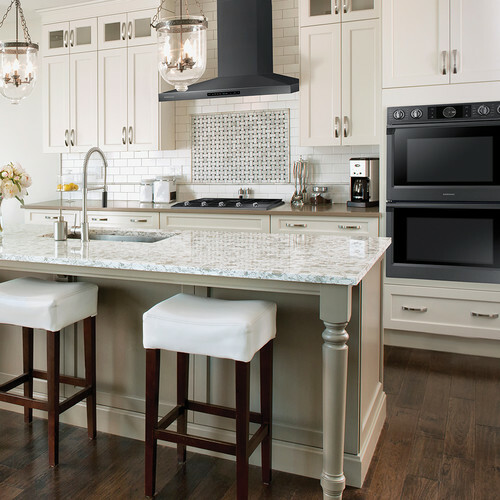 While a lack of oven space for multiple dishes is rarely a concern for most families (except perhaps around the Holidays), Samsung promises you will never be without oven space that can be set at different temperatures. 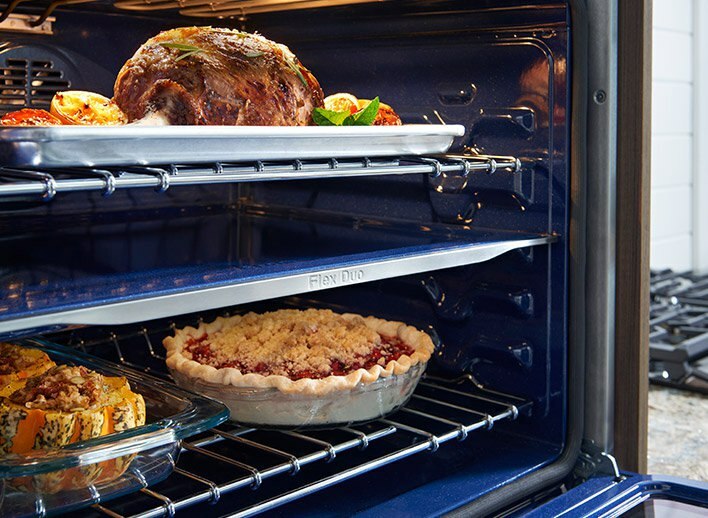 Samsung utilizes its Flex Duo divider in the upper oven creating a total of three independent ovens to cook multiple dishes simultaneously. Samsung’s oven capacity is an impressive 5.1 cubic feet. 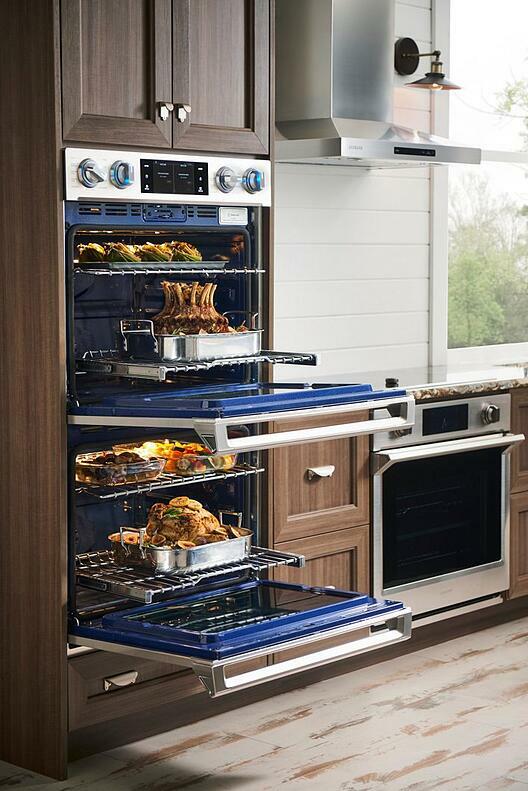 There is plenty of room for a large roast in either oven or multiple levels of rack cooking space. Each oven also has full convection capabilities. What’s with the fascination towards steam? The reality is, the power of steam cooking has been utilized for several millenniums. In other words, it’s not new and, in fact, is an incredibly powerful and healthy way to cook. First, steam cooking is an easy way to cut out the use of cooking oils, which generally increase fat intake. Steam ovens have also been proven to retain important vitamins, minerals, and enzymes in food that would otherwise be destroyed in other methods of cooking. While not a true steam oven (i.e., an oven that offers customizable humidity levels for an extended period), you will benefit from improved texture and flavor from the increased moisture in the oven cavity. Added moisture is essential when you are trying to achieve crispy crusts on bread. The Samsung 7000 series wall oven has a built-in reservoir and does not require a plumbed water line for use. 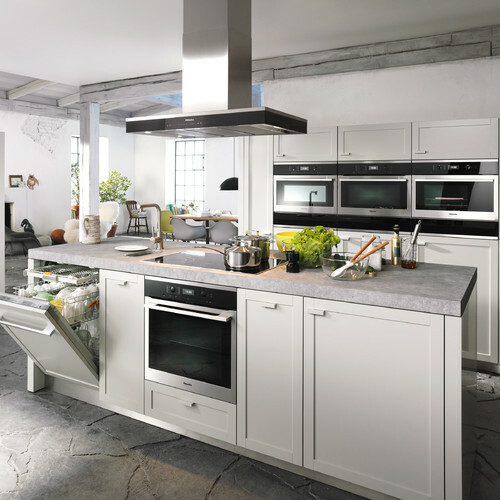 The first thing you will notice about one of Miele’s answers to the double wall oven market is the price difference. Miele’s M-Touch double wall oven, which first debuted in 2014 along with their other 6000 series appliances, is one of the most expensive double wall ovens in the industry.  However, you will have to search long and hard for drawbacks. Miele’s Master Chef cooking mode offers over 100 different meal choices and completely automates the cooking process. Miele, too, offers a variant of steam functionality, Moisture Plus. Miele's offer includes basic oven operating modes, if these special functions are not your thing. They also give you additional features such as Start Time, Ready at the Time, and Fast Preheat. Here is a video on Miele MasterChef. This is where the Miele oven truly separates itself from everyone else. Each oven includes TwinPower fans providing extremely even coverage of hot air throughout the oven cavities. Miele included a wireless temperature probe that integrates with its automatic programs and cooks your roasts to perfection. Miele’s Moisture Plus combines moist heat and the appliances intuitive cooking modes to precisely increase the moisture at specific times during the cooking process to achieve professional results. Again, similar to the Samsung, the Miele does not allow adjusting the humidity much like a true steam oven, but it does make the process slightly easier as it is a plumbed unit. Note that this article will be updated in the future to keep pace with the frequency of Samsung's innovation. The ovens have similar features, yet Samsung has Wi-Fi. However, it is not exactly functional at this writing. We also have yet to cook with the unit. So, there are a few takeaways. First, Samsung will be less expensive, yet Miele will almost definitely be more reliable. Now, you should be aware of one other factor in your decision. If there are problems, Miele will be better at solving the issues then Samsung. Miele has longevity in the US, but more importantly, the commitment to support their customers and product is better than Samsung. Want to learn more about wall ovens? Download our Wall Oven Buying Guide for more information about Samsung, Miele, and other top brands. Over 250,000 people have read a Yale Buying Guide.